We produce Coroplast and aluminum custom signs that can be inserted into one of our metal sign frames listed on this page. Make for great real estate sign frames. Vinyl graphics and lettering give you the best of both worlds -- low cost and high quality. They can be applied to a variety of surfaces and offer flexibility while serving a wide range of uses. It is more accurate and longer lasting than painted signs. Constructed out of 3/4" angle iron steel and hot-dipped in black to ensure the hardest paint finish and a high gloss appearance. Available in a number of sizes to accommodate sign blanks. Easily transportable. is constructed out of 3/4" or 1" angle iron steel and is available as a bolt-in and Slide-In Model combined into one. All frames have a handle for easy carrying. Our frames are hot-dipped or Powder coated black to ensure the hardest paint finish and a high gloss appearance. It is constructed out of 3/4" angle iron steel and is available as a bolt-in and Slide-In Model combined into one. All frames have a handle for easy carrying. Our frames are hot-dipped or Powder coated black to ensure the hardest paint finish and a high gloss appearance. This is our STANDARD ROUND ROD steel sign frame, constructed out of 1/2" round rod steel. This frame is available in several sizes in order to fit a variety of sign panels. Our frames are hot-dipped or Powder coated black to ensure the hardest paint finish and a high gloss appearance. These frames require nuts & bolts for assembly. Heavy duty portable frame made of 3/4" angle iron. Hinged on top. Welded carry handle. Holds two panels that bolt into the frame. Folds flat for storage. Black powder coat finish. Lightweight portable frame made of 3/8" rod. Built-in carry handle. Folds flat for storage. This unit is designed to suspend a single panel from center. Black powder coat finish. 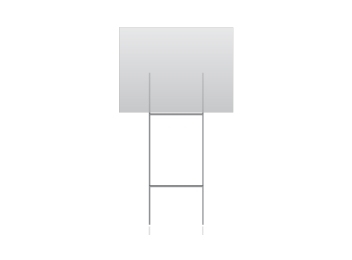 A 3/4" angle iron frame designed to hold a main panel along with 6" riders above and below. Rounded corner tops and spiked legs. Black powder coat finish. A 3/4" angle iron frame designed to hold a main panel along with a 6" rider above. Rounded corner tops and spiked legs. Black powder coat finish. 3/4" angle iron frame with a main panel section and a 6" rider space located below. The frame has rounded corners and spiked legs. Black powder coat finish, pre-punched bolt holes. Slide-in frame is constructed of 3/4" angle iron. Supports panels up to 1/8" inch thick with die-cut loops. Black powder coating. Holds (1) 18" x 30" sign and (1) 6" x 30" rider.